YC Condominiums has an 11-to-1 slenderness ratio, due to a small site (38 meters by 48 meters), floor plan restrictions from a heritage building on one side, and setbacks on all three sides. This dictated the demanded an extremely efficient structural and damping configuration, achieved with the Viscoelastic Coupling Damper (VCD) system, first applied here. 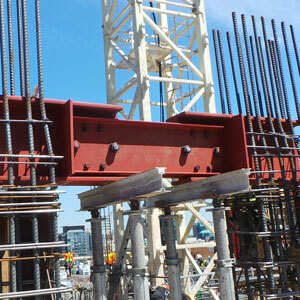 The structural system consists of a coupled shear-wall lateral load-resisting system in the narrow plan direction, along with a less-efficient reinforced concrete core. By concentrating lateral stiffness on these two coupled wall lines, large deformations are introduced into the coupling elements under both wind and seismic vibrations. When the walls rotate and undergo axial deformations, they deform the viscoelastic material, resulting in instantaneous viscous damping. This design for the tower resulted in a cost-effective, non-invasive and high-performing structural damping system for the tower that resulted in significant benefits to the developer, including 465 square meters of additional architectural space at the penthouse of the building, simplified construction, and reduced costs.